Under one pretext or another, my wife had always opposed my travel plans, and had I believed her I would to this day never have left Paris. Deep down the motive for her opposition was a mad jealousy for which I had long not provided any justification. To achieve my plan I therefore had to keep it secret, get my piles of music and a trunk adroitly out of the house, and depart abruptly leaving a letter to explain my disappearance. But I was not leaving on my own, as I had a travel companion who has followed me since in my various excursions. After being accused and tormented in a thousand ways, and always unjustly, and no longer finding any peace or rest at home, finally, with the help of chance, I assumed the benefits of a position of which I had been bearing only the burdens, and my life was completely changed. To cut short the story of this part of my life and avoid dwelling on very sad details, I will only say that from this day on, and after many long and painful splits, my wife and I agreed to separate. I see her often, my affection for her has in no way been affected, and the poor state of her health only makes her dearer to me. Berlioz moved in with Marie Recio (who later became his second wife) to her apartment at 41 rue de Provence, while Harriet on her side moved to 43 rue Blanche, and later to no. 65 on the same road. Some time in 1848, not later than July (cf. CG no. 1210), she moved to an apartment at no. 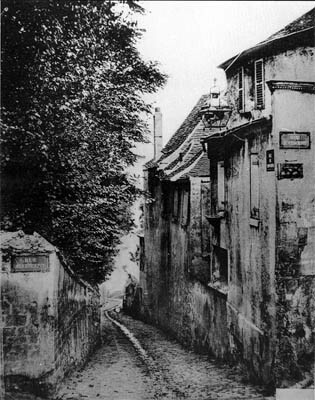 12 rue Saint Vincent in Montmartre, very close to the house where she and Berlioz had lived early in their married life. It is not known whether this was her own decision (Berlioz was in London at the time); at any rate the move brought her back to a place which had happy memories for her, and it was there that she was to spend the rest of her life. 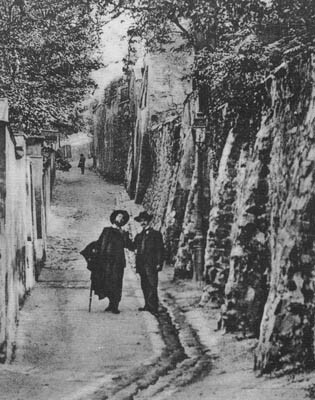 When in Paris Berlioz visited her frequently: rue Saint Vincent was within walking distance of Berlioz’s domiciles at the time (rue de la Rochefoucauld till 1849, then rue Boursault). She also received occasional visits from her son Louis, as well as from friends in Montmartre. In October 1848 Harriet became gravely ill after a stroke which left her half-paralysed (CG no. 1236). The story over the next few years is known from Berlioz’s correspondence with his family, in particular his two sisters Nanci and Adèle, from which a few excerpts may be cited. […] Harriet is still reasonably well. To answer your questions about the expenses for her house in Montmartre I will tell you that they amount to at least 3,500 francs a year when Louis is not there. The two servants economise as much as they can except for laundry, which is ruinous. Harriet died on 3 March 1854. The story of her death and subsequent burial in Saint Vincent Cemetery is told in detail in a series of letters. Harriet died last Friday the 3rd of March [Berlioz writes ‘the 4th’ by mistake]. Louis had come to spend four days with us and had left for Calais the previous Wednesday. Fortunately she saw him again. I had just left her a few hours before her death, and came back ten minutes after she had breathed her last without pain or any movement. The final ceremony took place yesterday. I had to look after everything myself, the registry, the cemetery… Today I am very distressed. She was in a dreadful condition; paralysis was complicated by erysipelas, and she had the greatest difficulty in breathing. She had turned into a shapeless mass of flesh… and next to her this radiant portrait which I gave her last year where she can be seen as she was with her great inspired eyes. Nothing remains. 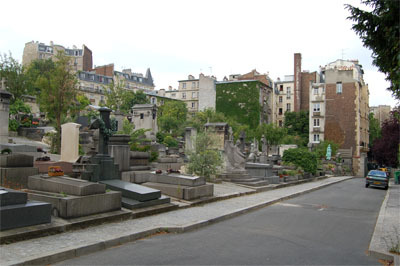 My friends came to my assistance, and many men of letters and artists led by Baron Taylor took her to the cemetery in Montmartre which lies near the sad house. And this dazzling sun, this panoramic view of Saint-Denis plain. I was unable to follow the procession and stayed in the garden. I wrote to poor Louis yesterday. I am going to write to him again. Oh yes you are quite right to tell me I must consider myself lucky to have been here; I cannot conceive the thought that she might have died alone… It would have been too terrible. I will be obliged to pay the rent for another year, if no one can be found to sublet. I gave a few old clothes and two or three kitchen utensils to old Joséphine who had been in the house for at least ten years and who was recommended to me by Louis in his last letter. She will only be leaving in a month and I will give her a small gratuity. In 1864 a part of the cemetery, where Harriet’s tomb was located, was planned to be demolished to make way for housing developments. 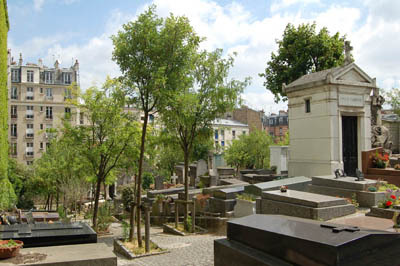 Her remains were moved to Montmartre Cemetery, where Berlioz’s second wife Marie had just been reburied in a new tomb. Berlioz was forced to undergo the same painful experience. 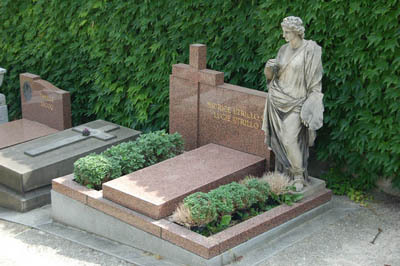 Harriet was reburied in the same tomb as Marie; Berlioz himself would join both of them in 1869. In his Memoirs (Postface) Berlioz ends the graphic description of the process by saying: ‘The two dead women now lie there in peace, waiting for me to bring my share of rot to this grave’. Unless otherwise stated, all the photographs on this page were taken by Michel Austin in June 2008. © Monir Tayeb and Michel Austin. All rights of reproduction reserved. 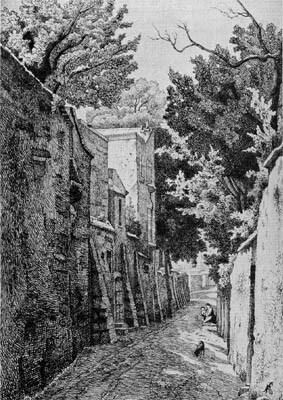 The 1865 engraving of Rue Saint Vincent is courtesy of Jacques Hillairet, Dictionnaire Historique de Rues de Paris (Les Éditions de Minuit, 1997, 10th edition); the 1886 and early 20th century photos of Rue Saint Vincent are courtesy of Philippe Mellot, Paris disparu (Éditions Michèlle Trinckvel, 1996). 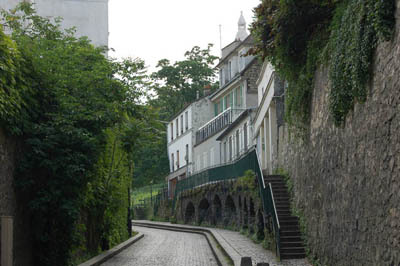 Rue Saint Vincent, on the north facing slope of Montmartre, runs straight down in an east-west direction for a length of about 400 m. The following photos give views of the road starting from near the top and progressing down in the direction of Saint Vincent cemetery at the bottom of the street. Harriet’s apartment was at no. 12 rue Saint Vincent, as is known from the official inventory of her possessions drawn up after her death and dated 27 March 1854 (the full document is reproduced in Cahiers Berlioz no. 2, published by the Association nationale Hector Berlioz, 1995, pp. 23-7; cf. CG nos. 1702, 1705, 1708). The original house is no longer extant (see below for the present no. 12) and it is not clear where exactly it was located along this road, except that it was very near the house she had shared with her husband in 1834-6, and also had a garden with a view to the north over the plain of Saint-Denis (cf. above CG nos. 1262, 1437, 1511, 1701). 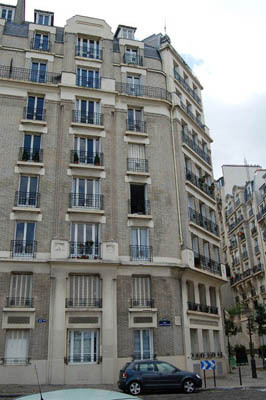 The building which replaced Berlioz’s home of the 1830s is the second on the left, at the point where rue Saint Vincent intersects rue Saint-Denis, which was renamed rue du Mont-Cenis in 1868. Rue Saint Denis is on the right in this picture. 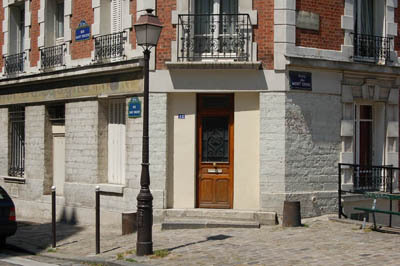 This is the first house on this side of the road, at the angle of rue Saint Vincent and the present rue du Mont-Cenis which intersects it in a south-north direction (in Berlioz’s time it was called the rue Saint-Denis). The present no. 12 lies at the junction of the two streets, diagonally opposite the modern block of flats which was built on the spot where Berlioz’s original home was located (see previous picture). This is an old vineyard on the left hand side of the road, at the intersection of rue Saint Vincent and rue des Saules. 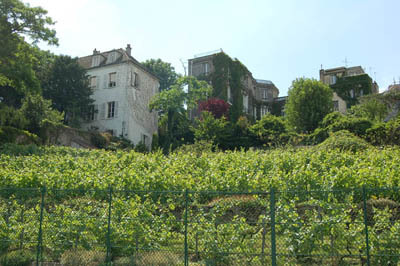 This plot of land became the property of the City of Paris in 1933, with the object of preventing property development on this site of Montmartre hill and to preserve the memory of the vineyards planted on the hill (Hillairet, vol. 2 p. 489). 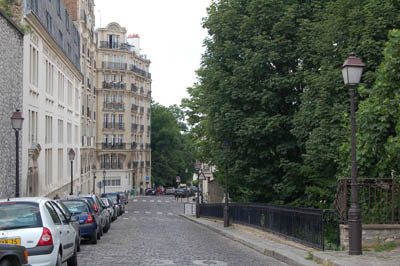 The wall on the right is that of Saint Vincent cemetery (immediately to the left is rue des Saules). 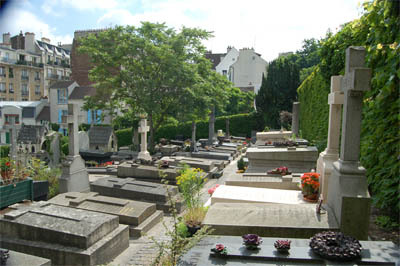 Access to the cemetery used to be from rue Saint Vincent itself, but is now from rue Lucien-Gaulard lower down and on the other side. 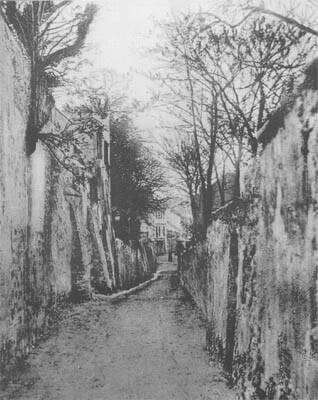 The lower part of rue Saint Vincent, looking up to the east, with the wall of Saint Vincent cemetery on the left. The above picture is courtesy of Philippe Mellot, Paris disparu (Photographies 1845-1930), Éditions Michèle Trinckvel, 1996, p. 278. 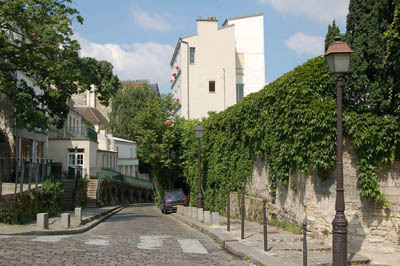 This shows the rue du Mont-Cenis running down from Montmartre towards the north, at the intersection with rue Saint Vincent. The present no. 12 rue Saint Vincent is to the left of this picture. The above picture is courtesy of Philippe Mellot, Paris disparu (Photographies 1845-1930), Éditions Michèle Trinckvel, 1996, p. 277. The above picture is courtesy of Philippe Mellot, Paris disparu (Photographies 1845-1930), Éditions Michèle Trinckvel, 1996, p. 275. This shows the junction of rue des Saules (coming down from Montmartre hill on the right) and rue Saint-Vincent (around 1905?). Saint Vincent Cemetery was opened on 5 January 1831. 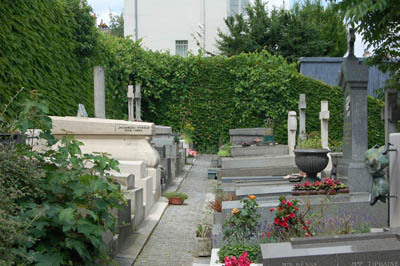 This alley within the cemetery leads to the present entrance of the cemetery on rue Lucien-Gaulard, behind the car. From 1831 to 1905, the entrance was in rue Saint Vincent where the present No. 40 is located (Hillairet, vol. 2 p. 489). Rue Saint Vincent is behind the wall on the left (see also the next photo). 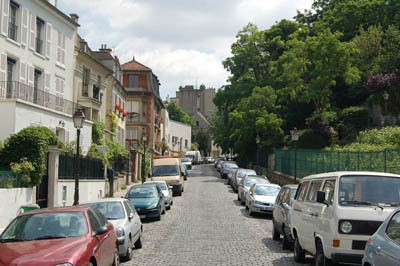 The above picture is taken from the opposite direction; here the wall which separates rue Saint Vincent from the cemetery is on the right. Maurice Utrillo (1883-1955) painted many sites and buildings of Montmartre, a number of which had Berlioz’s home as their subject. The Berlioz in Paris pages were created on 19 October 2000 (English version) and 20 October 2000 (French version). This page was created on 15 July 2009.